We are SO proud that our festivals have become so truly family-friendly. We see our community as extended family, and Family Camping gives our brothers and sisters who are raising families a safe and entertaining haven to enjoy the event with their children. Our dedicated staff, volunteers, musicians and other performers work hard to keep Wormtown Family Camping that kind of haven, and we are grateful for their efforts. With that in mind, Family Camping is not a babysitting service, and our helpers are not babysitters! Please stay involved with and aware of your young ones at ALL times. Parents are responsible for their children and they need to be monitored at all times. 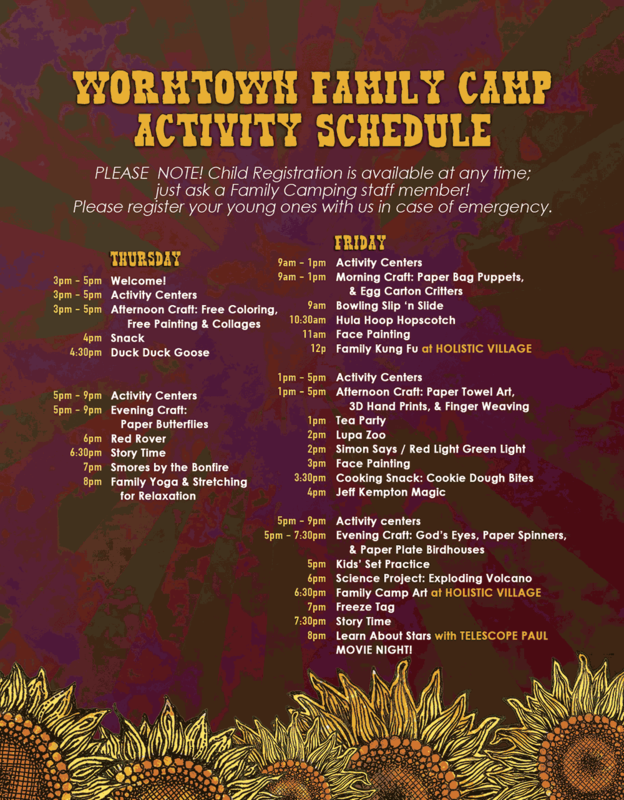 Family Camping has tons of games, art supplies, toys, and dress up stuff for the kids to use freely. (No games involving weapons are allowed). 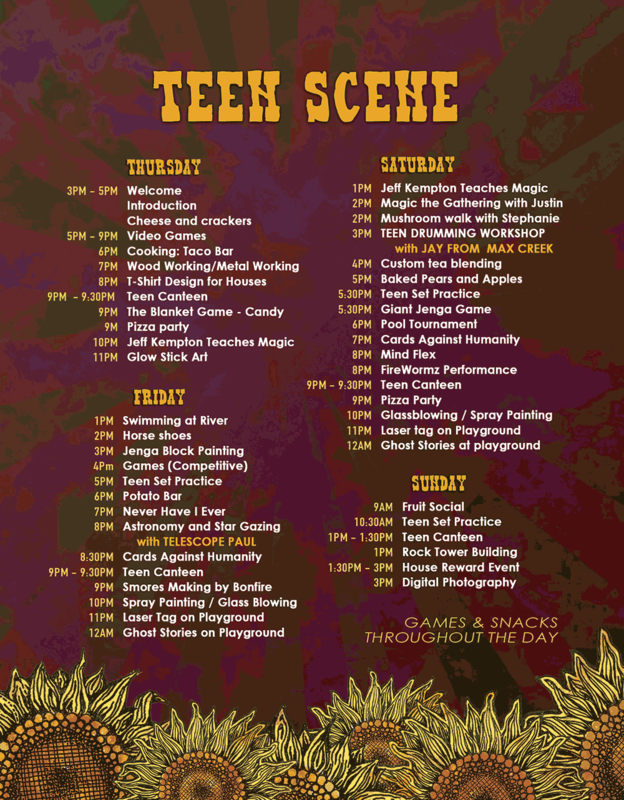 Scheduled activities take place throughout the day, including guided crafts and games, Magic shows, face painting, pizza parties, snacks and movies. 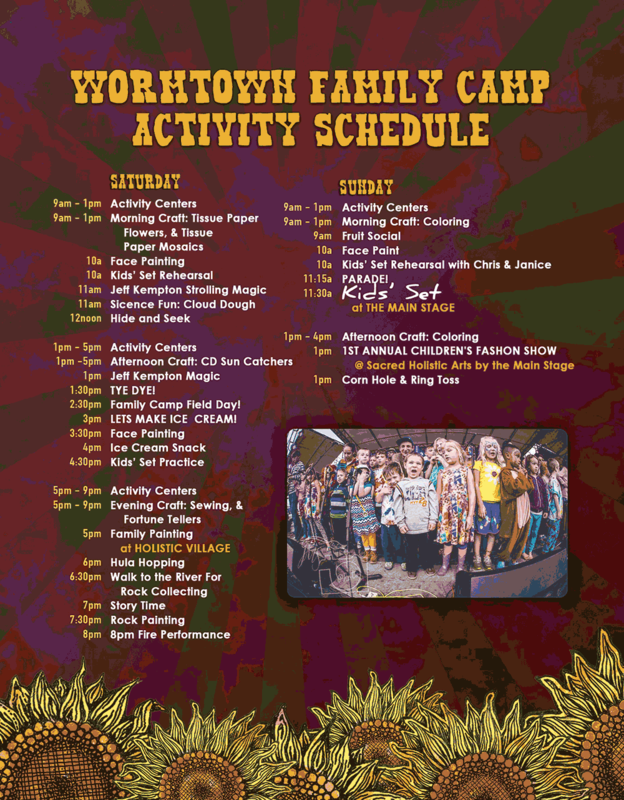 Many bands have hosted activities for kids at Family Camp, and every year the Holistic Village hosts various Family Activities, including foraging workshops and tea parties. We also encourage all children to join us for Music Rehearsals to prepare for the Main Stage Family Worm set which takes place along with a Parade on Sunday morning.